How much does a plane banner cost? Aerial banners cost vary with the square footage of the banner. However, once the aerial banner is created, it can be flown time and again over exciting events in cities and states across the nation. 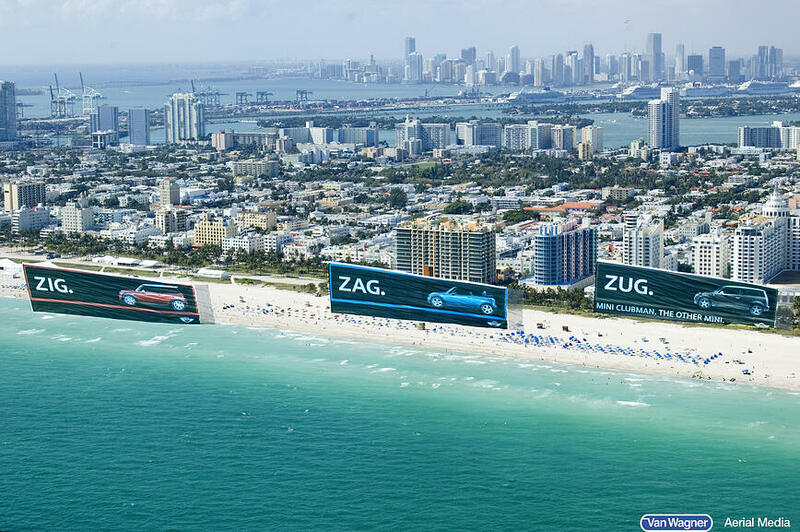 Think of it as your brand’s own customizable aerial billboard. If you are looking for the cost of a ‘Will You Marry Me?’ personal banner, the kind that has letters streaming behind a plane, we can help with this too. Click the free quote button below for a free analysis of your aerial advertising needs. - Duration of flight/ gas – This is a main factor when determining aerial advertising cost. When it comes to fuel, a 2 hour flight will be less costly than a 4 hour flight. We can help you determine the exact market that is best for your ad, the perfect event to fly over, and from there, determine the most effective flight schedule. Want to find out the cost of hiring a banner towing plane? Contact us today! We provide free aerial assessments to all interested parties. What types of materials are used for banners flying behind a plane? We commonly use a lightweight solid material for the production of our plane banners as it is durable, resistant to fading, and does not cause too much drag on the plane. Our banners are made out of the strongest and highest quality materials the industry has to offer. In order to not give out our secret recipe for banner creation, please contact us with your banner production questions. What makes Van Wagner Aerial Media’s banners different? All of our aerial banners include proprietary anti-wrinkle technology. We are the only aerial advertiser in the business that sew a pipe, or wind tunnel, into the top of our banners – allowing them to fly smoothly with complete legibility from spectators on the ground below. When you look at one of our banners flying next to a competitor’s you can really see the difference! What types of planes are used to tow banners? Commonly, single reciprocating engine aircraft are used for fixed-wing banner towing. Planes in the Piper Cub family are popular options, as well as Citabrias, and Cessna 150s and 172-180. For more information on what kinds of planes tow banners, click here. You can see these types of fixed-wing banner towing planes flying over Florida beaches, New Jersey beaches, California beaches, as well as large-scale events in cities across the nation. What is the ROI of sky ads? One of aerial banner towing’s greatest traits is its ability to deliver a message in a clutter-free environment. Because of the lack of competition in the sky, and the high number of impressions it delivers, aerial advertising has a higher ROI than you might think. Did you know? 88% of people recall the aerial advertisement they saw, and 79% know exactly what product was advertised. That is the highest rate of recall out of any media option. Aerial advertising is also one of the only media buys, besides Super Bowl commercials, that can reach over a million people instantly AND there’s no chance of your aerial ad being skipped over by the DVR. Find out more! Click below for your free quote!